Tarkett Rhinofloor – Sheet Vinyl is tough, practical and hygienic. Our cushioned flooring is affordable, resistant to scuffs and scratches, and easy to clean. It’s even waterproof! Making it perfect for bathrooms, kitchens and conservatories. In fact its suitable for any room in the house. Make your selection of new flooring from our wide range of realistic wood designs, contemporary and traditional tiles, and striking plains. Our vinyl flooring is long-lasting, easy to clean and promises to be comfortable under foot for a long time to come. 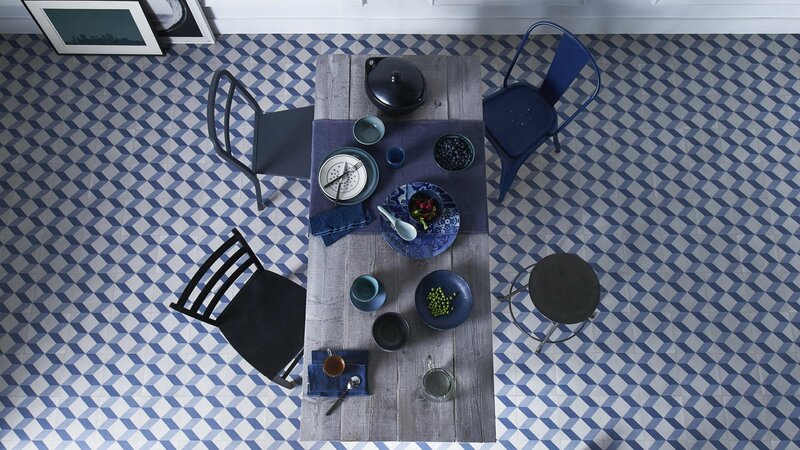 The Contemporary Tiles collection offers a refreshingly stylish selection of flooring designs for the modern home. Tough, practical and hygienic, this cushioned flooring is resistant to scuffs and scratches giving you a long-lasting surface which is not only waterproof, but also easy to clean. Therefore making it perfect for any room in the home. Affordable home flooring in unique and inspiring tile designs. Invented in the 1930’s, vinyl flooring first made an impact on the architectural world in the years following World War II. By the 1950’s, it was a major competitor against other resilient options. Therefore it had all but surpassed linoleum’s position as the best low-cost water-resistant flooring option for locations such as bathrooms and kitchens. A variety of desirable characteristics continues to make this versatile flooring material a popular option to this day. There are a variety of advantages that come with installing vinyl flooring in your home. These are the same tried and true characteristics that have been touted since the 1950’s by vinyl flooring retailers and suppliers. Vinyl flooring is relatively easy to care for. Above all make sure that grit and dirt are kept swept free to maintain the surface of the floor. Then, you can use a damp mop and an approved vinyl floor cleaner to remove stains. But few flooring options are as easy to care for as vinyl. A well-installed vinyl floor is almost impervious to water penetration, making this the perfect material for use in a bathroom, kitchen, laundry room, or other high moisture space in the home. Vinyl does not get cold in the winter and is generally softer beneath your feet than wood or ceramic tile floors. Some vinyl sheets and tiles, also have a padded under layer that can make walking on these floors even more comfortable. Vinyl is generally considered to be a highly durable material that, if properly installed and maintained, can last upwards of ten to twenty years. However, the quality of the material that you purchase and the way it was manufactured will determine how well your floor lasts over time. Printed vinyl tiles and sheets have a clear wear layer that acts as a surface barrier, protecting the floor from stains and spills. These materials are very easy to clean and maintain. Whatever your carpet and flooring needs we are here to help. Why not pop in to one our Carpet and Flooring Showrooms. To view our extensive range of floorings. Karndean, Amtico, Laminates, LVT, vinyl, coir matting, artificial grass, safety flooring, carpet and flooring. We provide a FREE – NO OBLIGATION QUOTE on all jobs. No matter how big or small, residential or commercial. Our team will happily visit your home or premises and bring samples with them.